The sounds of local radio stations from across the globe are now more accessible than ever before thanks to Radio Garden, a project created by the Amsterdam-based Studio Puckey and Moniker. The site lets users browse, and tune in to, live radio streams by rotating a 3D globe. "From its very beginning, radio signals have crossed borders," the description on the site reads. "Radio makers and listeners have imagined both connecting with distant cultures, as well as re-connecting with people from ‘home’ from thousands of miles away – or using local community radio to make and enrich new homes." The site is the first output from the project, which was designed in collaboration with the Netherlands Institute for Sound and Vision. 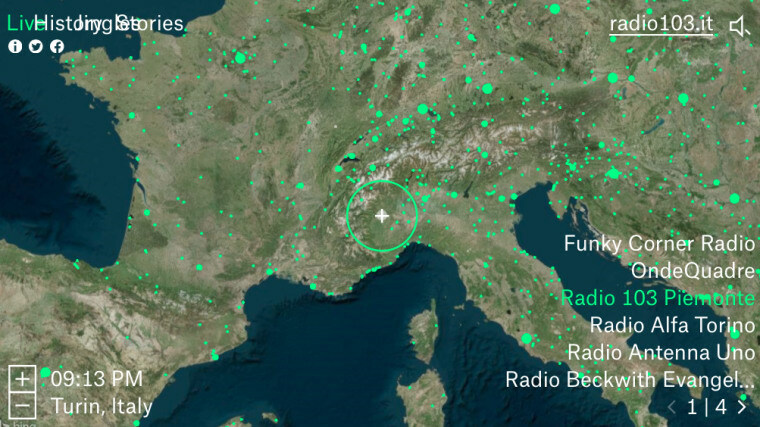 Using various tools like Google’s Time Zone API and satellite imagery provided by Microsoft Bing, the site's 'Live' tab features thousands of streamable stations, while the 'History' and 'Stories' tabs examine how radio signals have crossed borders. Explore live radio from across the globe here.